The Best Player in College Basketball this season Carsen Edwards! College basketball, which is the most exciting season, is finally over with the Virginia Cavaliers defeating the Texas Tech Red Raiders in a thriller of a National Championship game that went into overtime to decide who would be the 2019 NCAA Division 1 National Champion. Now, with the champion crowned, we can say that the best tournament in sports is over and that March Madness is over. 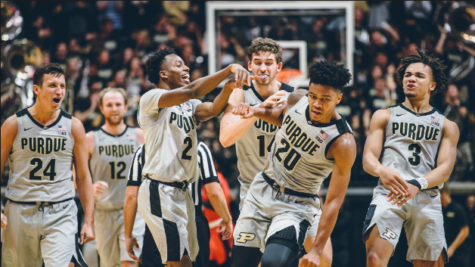 This year there was some crazy stats that happened in the tournament such as, most threes in a tournament by a single player, Carsen Edwards, and most overtimes in a single day with four games heading for extra time. This time of the year is the happiest and saddest for college basketball fans around the world because seniors play their last games for your favorite team, maybe your team shocks everyone or they get upset and maybe your team wins it all. With that being said, my favorite team,the Purdue Boilermakers had a surprising season after losing four senior starters. They started the year with a 7-5 record, then they went off on a winning streak and made the tournament as a #3 seed. They play Old Dominion their first game ,then they played the defending national champions Villanova Wildcats. Their 3rd game was against big favorite to win it all, the Tennessee Volunteers. That game will go down as one of the best games in Purdue history. Senior Ryan Cline dropped an amazing 27 points and they won in overtime. In the Elite Eight they faced the eventual national champion Virginia Cavaliers in a thriller overtime game. Purdue did not win but it was an amazing game and tournament run for the Boilers. 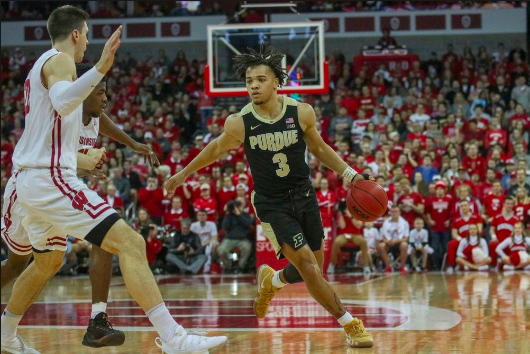 Purdue star Carsen Edwards made the most threes by a player in the tournament and averaged a crazy 35 points a game not a just for one game but for the for four games Purdue played. March brought a lot of disappointments such as the North Carolina Tar Heels, Tennessee Volunteers, Michigan Wolverines, and the worst in some eyes, the Duke Blue Devils. Duke was the biggest disappointment as they were seen as the clear tournament favorite. Yes, they made the elite eight but I would say almost everyone’s bracket had them winning it all with the big four of freshman of Zion Williamson, RJ Barrett, Cam Reddish, and Tre Jones. The only thing that held them back was their bad three point shooting and every team they played gave it their all to try and beat them. It was an amazing March Madness this year. It had many awesome moments and incredible shots. I hope most of you watched some of the games or at least made a bracket. I hope that everyone that missed it this year watches next year because the NCAA tournament always brings out many exciting moments! After all brackets are busted, I can’t believe March Madness is finally over. I like how you explained the ending of the tournament. Who would’ve thought Texas Tech would be playing in the National Championship while playing Virginia????? Great article! I liked how you explained the ending of it all. Very Good Article.